Hyman added an empty-net goal with 1:35 remaining to seal Toronto’s fifth straight home win. “Right now he’s out of any danger, from what we’ve heard,” Cassidy said. “That was amazing. It was unexpected, but it was greatly appreciated,” he said. Dermott beat Jaroslav Halak with a shot through traffic 17:44 into the game for his first of the season after the Bruins’ top line couldn’t clear the puck. Leivo put Toronto ahead 3-2 on the power play at 18:38, banging home Tyler Ennis‘ rebound after a rush by Marner. 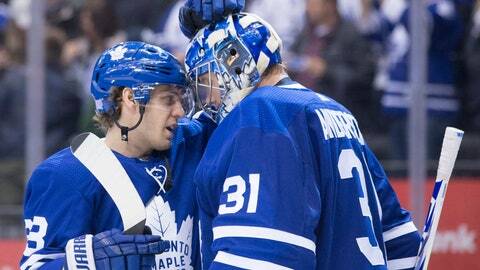 NOTES: Andersen is 11-1-0 in the regular season against Boston and 3-3 in the postseason. His last meaningful start against the Bruins was Game 7 of the first round of the 2018 playoffs when Boston rallied to end the Maple Leafs’ season with a 7-4 win. … It was the 672nd meeting between the two Original Six teams in a rivalry that dates back to 1924. … Both clubs were missing key players. Toronto was without Auston Matthews (shoulder), and restricted free agent William Nylander remains unsigned. The Bruins injury list included star center Patrice Bergeron (rib), and defensemen Zdeno Chara (left knee) and Charlie McAvoy (concussion). Sweden’s Jakob Forsbacka Karlsson, known as JFK, centered the Bruins’ top line in Bergeron’s absence. … Toronto defenseman Nikita Zaitsev missed the morning skate because of illness but played anyway.